Robert became the fourth generation of Russell’s to join American Pest Solutions in 1986. He was named the president of the company in 1995, and a Board Certified Entomologist in 2003. He has inspected and treated well over 10,000 structures for multiple pest issues. Areas of Specialty: Structural pest management, including but not limited to - wood destroying insects, commensal rodents, roaches, ants, bedbugs, flies and stinging insects. American Pest Solutions is a leader in the field and has received the honor of 60 years’ membership with the Better Business Bureau of Central new England as of March 2006. The company was started in Springfield over 100 years ago, and has been family run and operated by the Russell family for over four generations. American Pest Solutions is recognized by the NPMA as a QualityPro certified company, is an active member in regional and national pest management associations, and all employees attend annual recertification training and seminars to maintain their licenses. 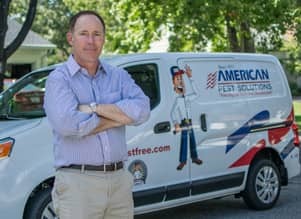 Licensed in Massachusetts and Connecticut as a pest control technician, Russell has been consulted regularly for advice regarding all phases of wood destroying organisms and their destructive tendencies upon structures, real estate disclosure oversights, and bed bug conditions – among other situations that could develop legal issues requiring expert knowledge. Attorneys, home builders, architects, homeowners, and real estate professionals have approached Bob for advice regarding their concerns. Over 30 years of practice has placed Robert at the top of his field as a consulting entomologist. Contact him at (888) 324-7025.